The history of St. Mary School is written in the labor, love, and sacrifice of many religious and lay people who over the last 150 years have dedicated their lives to the education of children in Christian values and the practical knowledge and experiences necessary to lead successful, fulfilling lives. Today’s St. Mary might be thought of as the culmination of a search for excellence that began in the humblest way in the mid 19th century. St. Mary traces its beginnings from 1860 when the French born priest Fr. Louis J. Filiere, then the mission pastor serving St. Mary and later the first resident pastor, obtained a building on School Street to open a school. Funding Catholic education apparently is not such a new problem as the fledgling school was closed due to a lack of funds shortly thereafter and reopened only after St. Mary had become a parish in its own right in 1865. Edward A. Dolan a student for the priesthood who lived with Fr. Filiere was the first schoolmaster. Initially, the school was staffed by lay teachers, then by Sisters of Holy Humility of Mary (1876), lay teachers again (c. 1879), and again by the Sisters of Holy Humility of Mary (1885). In 1915, the Sisters of Saint Joseph took over staffing of the school and commuted from their convent in Cleveland. A convent was eventually established on Front Street and later moved to Kraft Street and sold in 1981 when the last resident St. Joseph nun left the parish. Education in the 19th century in a small community like Berea was at best uncertain. Financial crashes like that of 1873 had to be survived, as did the loss of 100 Polish families to the newly formed St. Adalbert’s parish in the same year. Fr. Hannan, who placed the Sisters of the Holy Humility of Mary in charge of the school, succeeded Fr. Filiere. In 1879, Fr. John T. Carroll was appointed pastor. Lay teachers were once again put in charge of the school. The upper grades were transferred from the building on School Street to a place next to the Mechanics’ Hotel, where the Armory now stands on Rocky River Drive. The lower grades remained in the basement of the church. By the turn of the 20th century there were 60 pupils in attendance at St. Mary. The school closed several times in the period before 1915 because of a lack of funds. When this happened, the children were sent to the old Union School for their education. In 1915, the Sisters of St. Joseph of Rocky River were appointed to teach in the grade school, an assignment that lasted until 1981. These were indeed simpler times. During the Christmas season, children gathered the pine and evergreens from the woods that the nuns fashioned into the church decorations. Fr. John L. Lillis, pastor since 1910, organized plays put on near St. Patrick’s Day, which netted several hundred dollars to keep the school in existence. Fr. William H. Moseley, who had become pastor in 1924, made building a new school a priority. He hired an architect to build the new school and broke ground in December 1925. A labor strike in the summer of 1926 delayed construction, but the school was completed in the fall at a cost of $58,000. The new school was built in front of the old frame schoolhouse, which was used as a cafeteria and a meeting hall. The new school had four classrooms, an office, and a clinic. 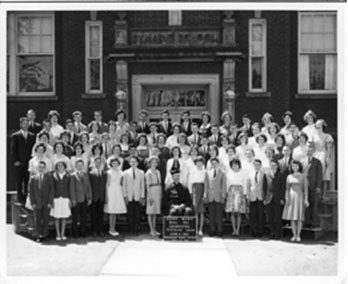 In 1943 enrollment in St. Mary reached 150 students and the school was becoming crowded and new facilities were needed. 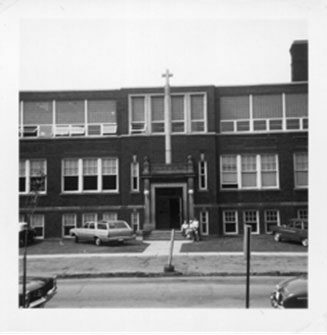 In 1949 with 650 families in the parish and 220 students in the school the pastor decided to build an addition to the school. The campaign goal was $50,000. Five more classrooms were added to the school at this time. The Cana Club, which was organized in 1947, helped raise money to furnish the classrooms. Completion of the addition brought the school’s capacity to 360. Again in 1955, when the school population was bursting at the seams, the parish decided to enlarge the building. Eight classrooms, 28x33 feet, were added to the school and an auditorium seating 500 people was constructed in the rear. The cost of the addition, $200,000 was paid off in seven years. Parishioners, asked to raise $150,000, pledged $174,000. In 1955, the old frame schoolhouse, which had stood for 70 years, was torn down. There were 650 families in the parish when Fr. Kathe began to build another addition to the school. The physical foundation of today’s St. Mary School was laid with the acquisition from the Berea public school system of the old Robert Lechner Elementary School at 265 Baker Street, just one block north of the current church. After leasing the school for three years, Fr. John Garrity purchased it for $500,000 in an open auction bidding process. The appraised value of the property, which included 10 acres with athletic fields, was $800,000. At the same time, the 60-year-old school on Front Street was sold for $400,000 to the neighboring Aristocrat Nursing Home. Today’s St. Mary School consists of a modern educational facility that has grown from the original structure purchased in 1985. The physical plant has since been expanded twice. In 1996 Fr. Garrity oversaw the construction of a new Media Center. This addition provided the school with a modern library and computer lab. It also brought a wireless communications network and full communications capabilities for teachers and students alike. Construction of 4 additional classrooms was completed in 2000. These rooms currently serve our kindergartners and 1st graders. During this time frame, due to the demand for quality Catholic education, the decision was made to expand the school from 1 class of every grade to 2 classes of every grade. With the beginning of the 2007-2008 school year, St. Mary had 2 classes of every grade, K-8. This great success is not without its challenges. At the end of the 2006-2007 school year, St. Mary pastor, Fr. George Vrabel, made the decision to “Complete The Mission” and expands the school to both accommodate the additional students and provide for additional preschool opportunities. 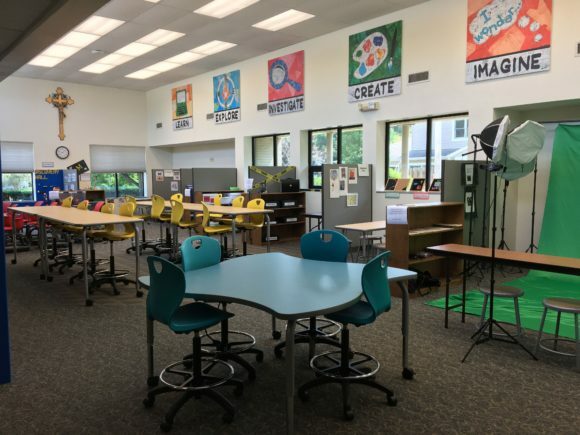 In the summer of 2017 St. Mary School once again sought to be in the forefront of educational technology by renovating the Media Center to include a student Collaboration Space and a STEAM Lab called the “Discovery Hall.” The newly transformed areas now bring technology and 21st Century learning skills to our students. From our humble beginnings we have come to the present day where we continue to provide a solid Catholic education to the children of Berea and the surrounding communities.